Trooper John Allen (right) is the accident investigator. Allen was assisted by Deputies David Sottasanti (left) and Josh Sanders (center). 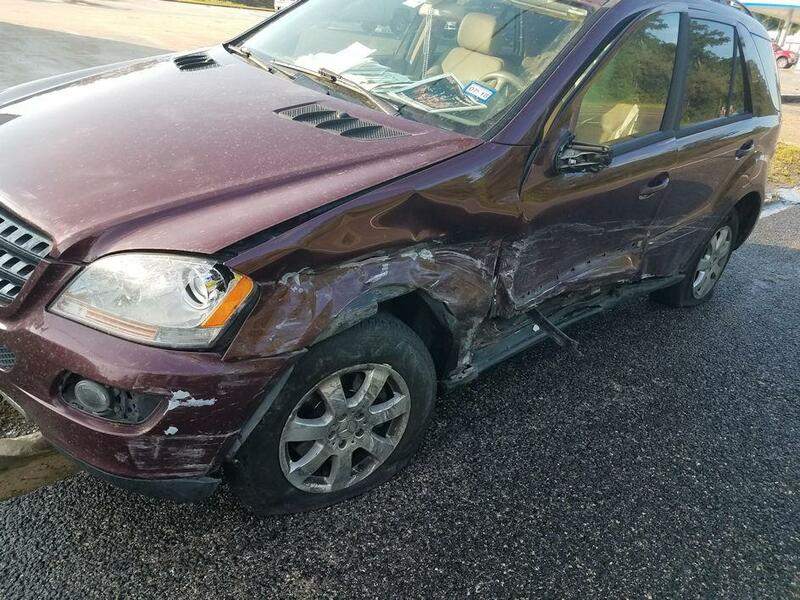 2 Vehicle Accident, 1 Hospitalized, LEGGETT, September 19, 2017 - At approximately 5:30 pm on September 19, 2017, a maroon 2006 Mercedes ML-350, driven by Stephen Bailey, 68, of Livingston, was south-bound on US-59 in Leggett. As Bailey was passing the Leggett Chevron, a north-bound white 2010 Dodge Charger, driven by Cynthia Garcia, 25, of Corrigan, attempted a left turn into the Chevron parking lot and failed to yield to Bailey. The vehicles clipped each other. Bailey pulled to the right shoulder while Garcia's vehicle came to rest in between the north and south-bound lanes of 59. Americare Ambulance Service was dispatched to the scene along with the Livingston Volunteer Fire Department, Deputies David Sottasanti and Josh Sanders with the Polk County Sheriff's Office and Troopers John Allen and Chris Cain with the Texas Highway Patrol. Garcia sustained undisclosed injuries and was transported by ambulance to CHI Livingston Memorial Hospital. Bailey was physically okay. Traffic on the south-bound side of 59 was partially blocked during investigation and cleanup. Garcia is facing a citation for failure to yield right-of-way. Both vehicles were recovered by Clifton Chevrolet out of Corrigan. 25 year old Cynthia Garcia, of Corrigan, lay on the pavement in Leggett. Garcia may have a broken arm and other injuries. Garcia was north-bound on 59 in this 2010 Dodge Charger and attempted a left turn into the Leggett Chevron parking lot, but failed to yield to a Maroon Mercedes Benz ML-350 driven by 68 year old Stephen Bailey of Livingston. Stephen Bailey was driving this 2006 Mercedes Benz ML-350. Garcia was transported by ambulance to CHI Livingston Memorial Hospital. Both vehicles were recovered by Clifton Chevrolet out of Corrigan.